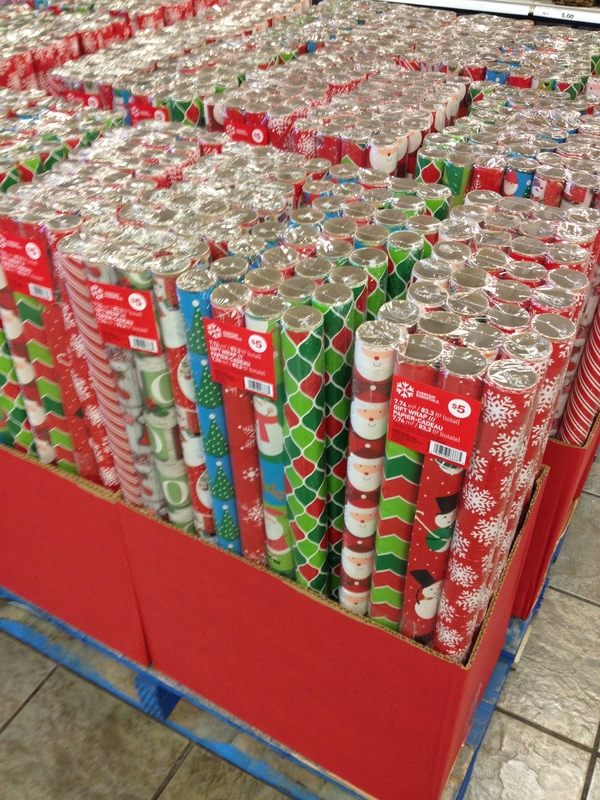 ‘Tis the Season … To Buy Wrapping Paper? Stores have had their holiday displays up for weeks, but until the snow fell this past week, I wasn’t quite prepared to think about it. While I LOVE winter (I know … it’s a weird and unpopular thing to say) I find the holiday season to be a mixed bag. On the one hand, it’s wonderful to spend time with family and friends; on the other hand, there’s the stress of obligatory and thoughtless spending (and the effort of trying not to feel like a Scrooge if you choose to opt out of the obligatory and thoughtless spending). There’s the trips back and forth to the mall to mull over over-packaged crap. And then there’s the sheer waste that accompanies the wrapping of all these gifts. So there’s something very satisfying to simply saying, No, thank you to the plastic-encased packages of wrapping paper that are gracing shop shelves everywhere. My mother taught me to sew when I was young, but the hobby hit new levels when my husband bought me a serger for my birthday when I was pregnant with our first child, over 18 years ago. I spent many happy hours sewing adorable dresses and rompers for her — squeezing as much creativity out of her nap-times as humanly possible. I also spent a fair amount of time at the fabric store, drooling over texture and pattern, my imagination running wild. And that first autumn of motherhood, when the store brought in their holiday-themed fabrics, a light bulb turned on. What better way to be festive and creative and to take care of the environment than by sewing reusable gift bags? These bags are very simple: a basic pouch with a wide upper hem and a gap in the side seam to leave room for a cinching cord. That first year, I made them as I brought purchases home, making the bags just slightly bigger than necessary. Over the years, as our family grew, I added to the collection, making some small enough to hold a gift card, some big enough to hold a large LEGO set. I also left some lengths of fabric un-sewn: very large items can either be draped with fabric, or wrapped using exactly the same folds one would use with paper. Instead of tape, these packages are tied with a length of yarn, similar to the way paper gets bundled for recycling, or the way we used to tie packages being sent in the mail. Gift tags are small bits of red or green card stock, hole-punched and strung on the cording or yarn. And of course, this means that the aftermath of Christmas-morning present-opening is incredibly easy at our house. There’s no hemming and hawing over which wrapping paper is recyclable and which is not, and there’s nothing to bag and set out onto the street for the garbage truck. The fabric bags and lengths of fabric are simply folded up, the yarn re-wound into neat bundles, and everything gets put back into the storage bin for next year. Of course, one doesn’t have to be a seamstress to wrap gifts in an environmentally-friendly way. Besides the tried-and-true newspaper comic or shoebox approach, a rummage through the linen closet can give you everything you need to wrap gifts: there’s napkins, tea towels, pillowcases, sheets, tablecloths, those curtains you should’ve dropped at Goodwill months ago … any of that, plus a ball of yarn, and you’re good to go! Presents can also be hidden in plain view: my husband once “wrapped” my birthday present (a houseplant guidebook) by shelving it, and giving me a note instructing me as to where I should look. A game of hide-and-seek and a present! A moment in the hand, a lifetime on the land. Is it really right that our ten seconds of anticipatory pleasure results in the creation of garbage that will likely never, ever disappear from the landfill? So my nine year-old son’s school fundraiser just wrapped up. As far as fundraisers go, it’s fairly innocuous: we’re not being asked to sell unhealthy chocolate bars or chemically-laden toxic microwave popcorn, and there are no junky products to purchase and pawn off as Christmas presents. All we’re being asked to do is sell magazine subscriptions. Because we subscribe to two magazines — and the grandparents to at least half a dozen — I could in theory renew eight subscriptions through this fundraiser. I could even go further: I could scour the offerings and find something fun and educational and give my kids subscriptions as Christmas or birthday presents; I could finally treat myself to a subscription to Maclean’s, a Canadian news magazine I devour at the dentist’s office; I could also encourage my son to canvas the neighbours and hit them up for new subscriptions or renewals. So what did I do? I did what I’ve done for years: I boycotted the thing, and in lieu of a form filled in with a dozen or so magazine subscriptions, simply sent the school a cheque. Why in the world is something like this necessary? Why do kids need the whole A + B + C + D + E etcetera ad nauseam plethora of prizes? Here’s why: these companies don’t want to take the risk that a child who really, really wants prize C — the inflatable safari sneakers — will either a) be disappointed if his or her mother insists on buying more than six subscriptions, or b) (much worse) STOP selling subscriptions when he or she hits that magic number! Yes, this is part and parcel of the whole children mustn’t ever be disappointed mentality that permeates child-rearing these days, and while I completely disagree with it, I do understand that this is the method behind the madness that this fundraiser company has adopted in setting out their prize menu. There are three more ways to earn cool prizes! Every time you sell a subscription to Maclean’s, Today’s Parent, Chatelaine, or Flare, you will receive your very own SUPER BEAR! Every time you sell a subscription to Reader’s Digest or Sélection, you earn an iSquirt Water Squirter! Go to the fundraiser website, send 12 or more emails to family and friends and earn a hand-held Crank Fan! Of course, that’s IN ADDITION to the bundle of crap you’ve already received! Oh Joy! Because that’s not all. Of course it’s not. Get this: with every. single. subscription. sold, the child also earns a collectible key chain. Last year it was monkey key chains. This year it’s bears. One of my son’s friends went home this week with twenty keychains. Twenty. I have no words for this. So let’s see … if my son were to sell a dozen subscriptions — ahem, in other words, if I were to call the grandparents and ask them which magazines we could renew via this fundraiser, if I fill out the form with all the other subscriptions, including that coveted Maclean’s — he would receive the following prizes: a mouse racer, goofy glasses, inflatable safari sneakers, a plush toy animal, a water bottle hoodie with clip, a splash light, and his very own super bear! Oh, and I almost forgot — he’d also receive 12 keychains. That’s a grand total of 19 prizes. Step 1: I can raise awareness on issues by talking to other people. With regards to the magazine fundraiser, I asked the PTO if they would consider doing this fundraiser without the crappy prizes. To their credit, when it was brought up at their next meeting, all but one parent — who seemed to think the kids needed junk as an incentive to sell magazines — agreed that the prizes were garbage-y and unnecessary. “Good riddance” was the operative feeling. A phone call was placed by the fundraiser chairperson, but just like the Scholastic book fair people, the answer came back in the negative: No, you cannot run this magazine fundraiser and opt out of the prizes. Okay, so that didn’t work. Step 3: I can write a letter to the company and express my concerns directly. So this post marks the beginning of a series — The Squeaky Wheel Gets the Grease — in which my complaints find voice in a letter that actually gets sent to the company in question. I realize my bee-in-a-bonnet obsession with the crap that’s filling our children’s lives isn’t going to be everybody’s cup of tea, and will get pretty tiresome if I’m not careful, so this will only be an occasional thing. I am just one parent in one school in perhaps hundreds of schools who participate in your magazine fundraiser, and I am writing this to you as an individual, not at the behest of my school’s PTO. Nevertheless, I would like to tell you why I have refused (for many years) to participate in your fundraiser. While I would appreciate the opportunity to support our school through magazine subscriptions, I choose not to do so because I strenuously object to the fact that participation means my child will receive a bag filled with junk at the end of the fundraiser. I’ve counted 12 magazine subscriptions that our family could have bought or renewed through your fundraiser; our particular selection would have resulted in my son bringing home 19 prize items. This is ridiculous. Do you honestly believe the children are doing the bulk of the selling for this fundraiser? You specifically instruct children not to go door to door, to only sell to relatives, friends, and co-workers. Who is actually doing the work here? If it’s the parents doing the work, I can assure you they do not appreciate a bag full of prizes coming home at the end of the fundraiser. Even if the children are doing the fundraising, why is the escalating prize menu necessary? Does a child who sells a dozen subscriptions really need to receive six or more prizes and twelve keychains? Is one item not sufficient? To be blunt, is a prize even necessary? Given the fact that schools are raising funds in order to provide students with added opportunities — everything from i-pads to smart boards to playground equipment — why is anything above and beyond the end result even necessary? It is clear that with the exception of the iPad Mini and (perhaps; I’m no expert) the Beats Headphones, all the prizes are – to be blunt – junk that has little to no long-term durability or play value. Each and every one of these items is destined – sooner or later – for the dump. Given the fact that our landfills are filling and our oceans are teeming with plastic, given the increasingly dire warnings about global warming, the last thing children need in their lives is more junk. Precious and finite resources are used in the manufacturing and shipping of these items; this kind of waste is truly outrageous. Why must schools be complicit in the giving away of junk in order to sell magazines and raise money? I’ve talked to many parents who share my concerns. Why don’t you poll your participating schools and float the concept of a prize-free fundraiser? If you were to offer prize-free fundraisers, I wonder if you would actually make more money. Surely these prizes cut into your profits? How about having someone at your company crunch the numbers: figure out the cost of the prizes versus the expected drop in numbers of sales (if indeed there is any drop in sales; perhaps other parents are boycotting your fundraiser for precisely the same reason I am). Thank- you for your time and consideration of this matter.